“It can’t happen again” was the thought going through Michelle’s head as she waited for her test results. She had already faced cancer once before. At 11 years old, she was diagnosed with leukemia and had two years of aggressive chemotherapy. After going through that experience, Michelle thought she had a “get out of jail free” card when it came to cancer. That was not the case. One evening after Michelle put her children to bed, she discovered a lump in her breast. 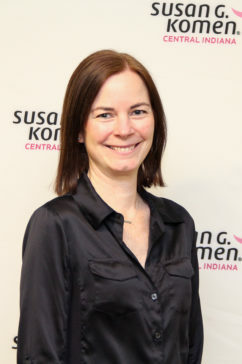 After getting a mammogram, biopsy and speaking with a breast surgeon, Michelle was diagnosed with Stage 2 invasive ductal carcinoma. Since she had a history with leukemia, her treatment plan had to be thought out carefully. She received a bilateral mastectomy, followed by an axillary lymph node dissection and later radiation. She completed her treatment on January 14, 2012. Michelle’s cancer journey inspired her to write a book for her children about her life and to act on a lifelong dream of becoming a nurse. Specifically, she is an oncology nurse. Her experiences allow her a unique perspective and a special connection with her patients. Michelle participated in the race both pre-and-post breast cancer. She is looking forward to the opportunity this year and be an ambassador for the event.